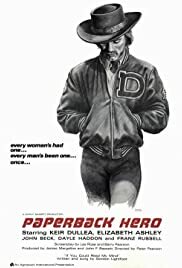 A hockey player in a small town begins to lose his grip on reality, and starts to believe that he is a gunslinger in the Old West. There are a few really good reasons why people should make an effort to see this film. First of all, it is a rare feature film unapologetically set in Saskatchewan that is above all entertaining. More importantly though, it is a good comment on Canadian culture being influenced by American culture in a fatal way. I found Keir Dullea's character, Rick, charming as the wanna be sheriff of a small Saskatchewan town in the 70s, equipped with a holster, cowboy hat and chaps, and a sheriffs star on the side of his bright red car. More importantly, the town never mocked him, and when they did he would always stood up for himself and beat the crap out of people making fun of him . In fact, as this dreamer he becomes the only interesting thing in the town which has you rooting for him throughout the film. If you're not reading between the lines of what this film is about though, it's still enjoyable to watch. And in its defence, it was made before the Tax Shelter era, so you can't write it off as a product of those days. It actually took heart to make this film, and it shows on screen.